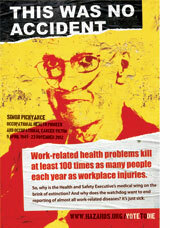 Workplace health and safety is about you. It’s about blood and sweat, not pounds and pence. You are not a variable in the company accounts, you are a human being. You are not mollycoddled. You work hard and it can hurt your body and hurt your brain. 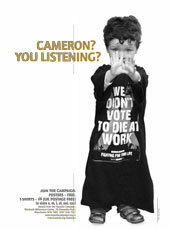 For tens of thousands in the UK each year, work is fatal. You deserve better protection. You want it? 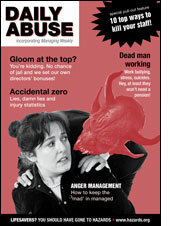 Then support Hazards editor Rory O’Neill for the leadership of the Health and Safety Executive (HSE). With the man from Hazards installed as the new chief executive, you’ll see a very different kind of safety watchdog. The all new HSE will not apologise for standing up for your health and safety; it will not flinch from chasing down and exposing the safety criminals. 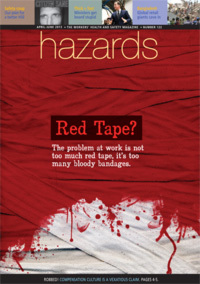 It will shout loud that the problem at work is not too much red tape, it is too many bloody bandages. All major injuries and cases of serious occupational disease will be investigated – scarcely any are at the moment – and there will be a presumption that enforcement action will follow. If a company is too dumb to abide by criminal safety law, then it is too dumb and too dangerous to be in business. HSE is a criminal law enforcer, but treats enforcement as the function of last resort [Hazards 119]. More often than not, it doesn’t even bother to look. HSE figures obtained by Hazards in 2012 revealed just 1-in-20 major injuries was investigated. 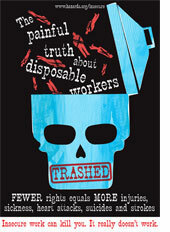 Only 1-in-170 of the fatal and major workplace injuries reported in 2010/11 resulted in HSE prosecution activity. Just 1-in-65 resulted in any enforcement action at all. Instead, HSE is pursuing forms of self-regulation by firms and stakeholder involvement that is all about trade groups stepping in and HSE stepping back. Firms should of course regulate their safety affairs, but this type of self-regulation is not an alternative to effective policing, it is the minimum responsible behaviour that should be expected from any business. Voluntary schemes have been tried and have failed spectacularly. In 2010 alone, the Institute of Directors/Health and Safety Executive (HSE) directors’ leadership guidance, HSE’s Corporate Health and Safety Performance Index (CHaSPI) and the HSE-backed Asbestos Building Inspectors Certification Scheme were all exposed as an expensive waste of time [See: Voluntary safety schemes fail, again and again]. The collapse of HSE’s inspection regime amounts to a deadly capitulation to a government bent on deregulation regardless of the human cost [Hazards 120]. A lack of oversight by official agencies has been implicated in a sequence of occupational and environmental catastrophes, from the Gulf of Mexico disaster in 2010 to the cancerous clean rooms of microelectronics manufacturers [Hazards 111]. Firms need oversight, and under the new HSE management, they will get it. 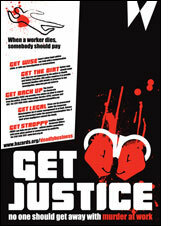 It’s not just about justice, it’s also about what actually works. Regulation, backed up by enforcement and workforce involvement, is the surest way to improve health and safety at work [Hazards 113]. Studies by official agencies in both the UK and the US have shown businesses take dangerous liberties when left to their own devices, and are far more likely to do the responsible thing when facing a realistic prospect of inspection, enforcement and criminal penalties. So the government should pay for safety. The HSE budget should be doubled immediately. Every pound spent on safety earns many times more in sickness, retraining, health care and benefits savings. The government should stop questioning HSE – the current Triennial review is the fourth government-ordered demoralising forensic examination of its role since David Cameron came to power in 2010 – and start supporting it [see: Thick and fast]. Our new look HSE will not accept business-courting ideology at the expense of real evidence. If you put aside the politics and get out the calculators, it soon becomes apparent that preventing occupational injuries and diseases is good for the economy as well as the workforce. It may sometimes pay for employers to cut corners, but that’s because they can ‘cost-shift’ the bill to the rest of us [Hazards106]. Irresponsible firms aren’t just satisfied with making money, they always want to make more money, regardless of the costs borne elsewhere. Analyses from the UK, US, Australia and elsewhere establish the total cost of neglecting workplace health and safety is astronomically high, but it barely falls at all on business – the one party with something to gain from cost- and corner-cutting at the expense of safety. This cost-shifting – which passes the tab largely to the victim and the public purse - makes claims by the business lobby and government that regulation is bad for business and a “job killer” an even more egregious lie [Hazards 113]. Sane economics requires a system that prevents harm, not inspections and enforcement. 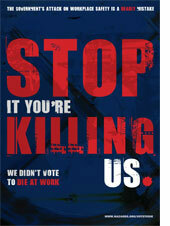 Each 'accident' death at work costs society over £1 million. And occupational diseases come at an even greater price. Government figures for 2004, not corrected for inflation, estimated each occupational cancer case came at a cost to society of around £2.5m [Hazards 118]. These aren’t the inevitable costs of doing business, either for safety or health. A 2013 paper in the journal Environmental Health Perspectives, whose authors included researchers from the UN’s World Health Organisation (WHO) and the International Agency for Research on Cancer (IARC), concluded preventing environmental and occupational cancers is both possible and “highly cost effective”. 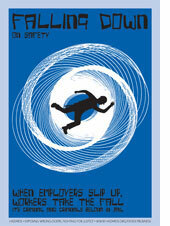 But the safety watchdog needs inspectors on the ground if it is to achieve anything. The UK’s official safety enforcement coverage is already way below par. The International Labour Organisation (ILO) sets a benchmark for the number of inspectors in an industrialised country of no less than 1 per 10,000 workers. Recent estimates suggest in Britain we are below one for every 15,000 [Hazards 117]. Double the number of inspectors and we’ll get somewhere close to a respectable ratio. The all new properly resourced HSE will also ensure that cost-shifting is a thing of the past. We shouldn’t all pay to give negligent directors bigger bonuses. Out-going HSE chief Geoffrey Podger was out-manoeuvred and humiliated by ministers – the all new HSE will bite the government hand that starves it. It will refute forcefully attacks by ministers, industry or professional raving discontents like Jeremy Clarkson. Government-imposed changes in HSE’s functions mean for many workers the watchdog has drifted into invisibility and irrelevance [Hazards 116]. Hazards will give HSE back its mojo. HSE will be seen and heard, standing up for worker safety and denouncing government attacks and irresponsible employers. The all new HSE will have no truck with government-fed nonsense about business burdens or red tape. Instead, stemming the health and cash haemorrhage caused by preventable injuries and diseases will be HSE’s primary objective. HSE will promote the monetary, social and health benefits of prevention, both in designing regulatory approaches and winning the case for health and safety with the government. HSE will have a new Bright Ideas unit, to encourage innovative, preventive, precautionary approaches. There will be a clearinghouse for best practice case studies, a Toxics Use Reduction wing to sunset the most deadly substances, and support for green production and a just transition from dirty, dangerous and demoralising work. Innovation is good – it means new products, new markets and new and better jobs. HSE will champion this precautionary principle as the economically and socially sound approach. It will end the culture of denial about risks from occupational cancer to the grinding, slow unpoliced deaths delivered just as surely by overwork and a lack of control over the job. Precaution works. A 2013 US study looking at the impact of a Toxics Use Reduction Act (TURA) in Massachusetts found that reported use of known or suspected carcinogens by industries in the state declined 32 per cent from 1990 to 2010 while releases to the environment declined 93 per cent from 1991 to 2010. Use of chemicals associated with lung cancer, the biggest occupational cancer killer, decreased 29 per cent while releases to the environment decreased 77 per cent. It also pointed out that a legally-binding Approved Code of Practice (ACoP) and greater awareness of HSE’s list of substances causing asthma was behind a drop in short latency respiratory diseases attributable to latex. With good laws and their enforcement, we can all breathe more easily at work. A paper published in the July 2013 edition of the Journal of Epidemiology and Community Health, looking at the impact of chemical control laws in Europe including the REACH regulations, confirmed “that the prevention of environmental exposure that is or may be related to cancer should become an integral part of cancer policies and cancer control programmes.” Several countries already recognise that occupational cancer reduction programmes can be highly cost-effective and quickly recover their costs. Killing people needlessly is an expensive business [Hazards 120]. If a death or major incident occurs at work, a new HSE Rapid Response Team will raid both the workplace and the boardroom. A dedicated Prosecutions Division will demand penalties including jail time that reflect the magnitude of the crime. Victims of workplace crime and their families will be fully involved in the process and will be supported by HSE liaison officers. Killing people at work isn’t the inevitable consequence of a business making money. It’s the criminal consequence of having the wrong priorities and the wrong controls. Naming and shaming is too good for criminally negligent and deadly firms. HSE will hound them all the way to the jail house. Directors behind major disasters, like former BP chief Lord Browne, won’t so easily enjoy political favour and influence [see: Safe hands?]. HSE doesn’t do health anymore, yet work-related ill-health claims at least 100 times as many lives in the UK as injuries. HSE’s near extinct medical unit will be resurrected and properly resourced. HSE’s medical wing will be our early warning system for emerging problems, not just a testing service to prove how many of us have been poisoned or diseased already. The reborn service will have workplace health hit squads to probe problems, in a manner similar to the US National Institute for Occupational Safety and Health (NIOSH), and will work with firms, unions and the workforce to resolve them. HSE will prepare realistic estimates of the harm caused by work and ditch its ‘where’s the bodies?’ statistical disappearing act [Hazards 92]. It will investigate linkages and inconsistencies between estimated numbers hurt by work and official reporting levels and compensation [see: Robbed!]. HSE has demonstrated acute sensitivity to business and government concerns about the impact of its activities on UK plc’s bottom line. HSE will switch its attention to the impact of hazardous work on the financial and economic well-being of workers. HSE under Hazards will promote and signpost access to compensation as a tool to deliver justice for workers and a sharp reminder to employers and insurers there are cost consequences of neglecting the health of the workforce. HSE will ensure wherever possible that workers are advised of the association between their work and any ill-health, their rights to compensation and their rights to have potential problems investigated and acted on. This will generate better intelligence and stimulate better prevention. The HSE board will be reconfigured. Employer and union representatives will be supplemented by voices from hazards, occupational disease advocacy and environmental justice groups. The current dysfunctional board is dominated by retired executives supplementing their pensions as consultants – 7 out of the 9 non-executive directors – and enjoying a nice little HSE earner on the side, paying a cool £16,000 for 30 days work. HSE’s leadership doesn’t know everything, and it should stop pretending it does. The new HSE will develop alliances with other organisations interested in and informed about the world of work – trades councils, NGOs, health charities like Macmillan, union branches, hazards groups and campaigns. HSE will abandon its smug UK-knows-best presumption. If the International Agency for Research on Cancer (IARC) says something causes cancer, HSE will believe it and take action to protect those exposed. Sounds reasonable? Well, HSE sided with industry when questions were raised about cancer and formaldehyde, a chemical soon after giving a top cancer risk rating. And when IARC recently warned about the breast cancer risk from shiftwork [Hazards 111] and the lung cancer risk from diesel exhaust, HSE played down the risks and did nothing, choosing instead to prolong a sterile debate about the already established risks [Hazards 120]. HSE should stop being the face of workplace safety complacency – it might seem like a great idea to the government, but it comes at a deadly price for the workforce. HSE should match or improve on the best practice around, including all relevant European Union, World Health Organisation (WHO) and International Labour Organisation (ILO) standards. Asbestos, the Buncefield and ICL blasts and Legionnaires’ outbreaks show what happens at work, doesn’t necessarily stay at work. So, HSE will engage with a much wider constituency. HSE will recognise that what happens at work can have an impact outside the workplace and will undertake public liaison and cooperation at a national and local level with community organisations, environmental groups and other interested grassroots parties. HSE will have labour and community liaison inspectors and regular consultative meetings in every region. HSE, though, will limit its regulatory oversight to workplace-related activities. It won’t split its resources with diversions like patient, fairground and gas safety – they will be left to other regulators. HSE will reinstate an in-house version of its Infoline and create a confidential Whistleblowers’ Hotline - HSE can’t be everywhere, but workers and the wider community can. A new Workplace Prevention Fund, split between employer and employee interests, will support practical initiatives and training. When it comes to life and death information, it’s not good enough to say ‘it’s on the website’. This treats workers like an inconvenience and leaves HSE behaving like a workplace safety wiki. The watchdog under our new management will make communicating with the workforce an ever-present core part of its work, when undertaking inspections and investigations and in designing solutions and in identifying problems. Essential to this will be reinstatement of the Infoline and the creation of the Whistleblowers’ Hotline [Hazards 116]. At the moment HSE refuses anonymous tip offs; this self-applied blindfold will be removed. A new HSE Workplace Prevention Fund, to be split between employer and employees interests and of a type operating in the US and elsewhere, will support positive preventive and training initiatives. It won’t be loose change. In the US, the Occupational Safety and Health Administration (OSHA) awarded approximately $10.7 million in 2012 through the Susan Harwood Training Grant Program. The grants went to 72 non-profit organisations, including the US equivalent of grassroots Hazards groups, community/faith-based groups, employer associations, unions, joint union/management associations, and community colleges and universities. 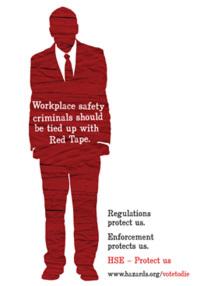 The UK safety watchdog’s redefined mission will be to protect workers. Period. And that means listening to them and providing the opportunities and resources for them to be fully involved and informed participants in identifying problems and rectifying them. Today’s worker is likely to have multiple jobs, more jobs through an extended working lifetime and will face rapidly evolving conditions at work. There are far more women, agency, temporary and migrant workers. The hazards of many modern workplaces are defined by precarious work, insecurity, discriminatory employment practices, harassment, stress, shifts, long hours, victimisation, blacklisting, erosion of employment protection and the impact of low wages on safe work choices and options. Underpinning this is a factor ignored by HSE – that occupational health and safety is a class issue. 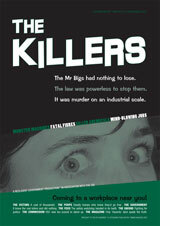 No-one dies in a fall from the boardroom table, or gets RSI from repeatedly abusing their staff. From occupational cancer, to stress to musculoskeletal disorders, the risks are concentrated at the lower end of work’s social class spectrum. 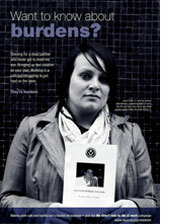 HSE is missing opportunities to target its support at the workers in the most deadly and damaging jobs. Work-related dust diseases and cancers are enormous public health problems that occur almost entirely in a small and easily identifiable section of the population. HSE has nothing to say on any of these issues. Under new leadership, HSE will get real and support workers suffering discrimination, disadvantage, victimisation, job fear and low pay with little control over the job they do. 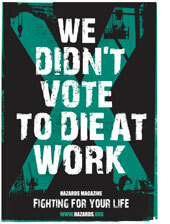 HSE will target Britain’s top occupational health problem - attrition. The day-by-day wear-and-tear of the job leaves workers ground down, spat out and sometimes worked to death. HSE ranks work by risk, with most workplaces outside its ‘high risk’ category exempted from preventive inspections [Hazards 120]. The watchdog says this allows it to concentrate its (rapidly diminishing) fire power where it is really needed. But it is employing a dangerously crude risk ranking tool based largely on injury rates and dominated by large industrial workplaces. Off HSE’s enforcement worksheet are jobs that do their damage by degrees, but these employ more and almost certainly harm more. Nurses, home care and checkout staff lift more in a year than many manual workers; cleaners may have higher chemical exposures than the workers producing the chemicals. The current risk ranking system will be abandoned and a new more sensitive approach employed. Occupational stress and related suicides, depression and anxiety, deserve better than HSE’s take-it-or-leave-it stress management standard. HSE itself estimates over 200,000 workers develop a new stress-related disorder each year. Fewer than 300 of these will receive compensation [see: Robbed!]. If compensation is so rare, you can bet preventive activities in the workplace are too. We need a new, legally-binding, code of practice on workplace stress and its prevention. 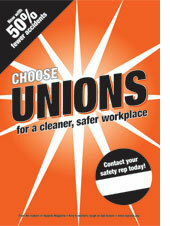 There are 150,000 trade union safety reps, on the ground and ready to go. They need the right to know, the right to act and the right to stop the job. The creation of roving reps and regional reps will expand their coverage. Safety reps will be able to rely on back up and support from HSE. HSE talks up the real benefits of ‘worker involvement’ or ‘worker engagement’ [Hazards 110], but it in reality it would rather see workers quietly in their place. That’s why the highly successful union-run Worker Safety Advisers pilot was never supported as a permanent complement to HSE’s work and why extended rights for union safety reps are not on the HSE’s to-do list [Hazards 115]. Under new leadership, HSE will ensure workers have a much greater voice at work and in the operation of HSE locally and nati onally. Do-it-yourself participatory research is the best hope we’ve got for identifying problems and fashioning solutions at work. Resources will be provided so bodymapping, risk mapping and other worker-led investigations at work become routine. Mirroring the situation in the US, this could be achieved by channelling resources from the new HSE Workplace Prevention Fund to the TUC education system, individual unions and groups supporting grassroots organisation on health and safety issues. 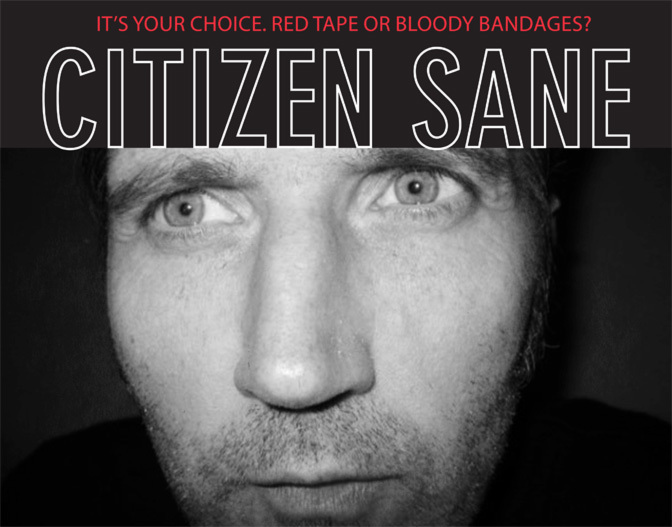 Support Hazards for a safer, saner future where workers are at the centre of safety policy, not the victims of it. If you like what we have to say, then ‘like’ our new facebook page spelling out our blueprint for a bigger, better Health and Safety Executive (HSE). The Hazards blueprint for a safer, saner Health and Safety Executive. All major injuries and cases of serious occupational disease will be investigated – scarcely any are at the moment - and there will be a presumption that enforcement action will follow. Out-going HSE chief Geoffrey Podger was out-manoeuvred and humiliated by ministers – the all new HSE will bite the government hand that starves it. HSE will have a new Bright Ideas unit, to encourage innovative, preventive, precautionary approaches. Innovation is good – it means new products, new markets and new and better jobs. If a death or major incident occurs at work, a new HSE Rapid Response Team will raid both the workplace and the boardroom. A dedicated Prosecutions Division will demand penalties including jail time that reflect the magnitude of the crime. The HSE board will be reconfigured. Employer and union representatives will be supplemented by voices from hazards, occupational disease advocacy and environmental justice groups. The current dysfunctional board is dominated by retired executives. HSE will reinstate an in-house version of its Infoline and create a confidential Whistleblowers’ Hotline - HSE can’t be everywhere, but workers and the wider community can. A new Workplace Prevention Fund will support practical initiatives and training. Today’s worker is likely to have multiple jobs, more jobs through an extended working lifetime and will face rapidly evolving conditions at work. HSE will get real and act on the problems facing today's workplaces with far more women, agency, temporary and migrant workers.